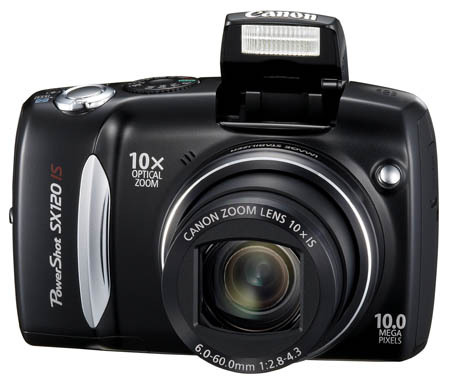 Due to be released in September of 2009, the Canon PowerShot SX120 IS is one of the more affordable of the "SX" series cameras. The "SX" series is part of Canon's "High-End" PowerShot models. This compact digicam features a 10-Megapixel imaging sensor, 10x optical zoom lens with optical image stabilization (IS), Digic 4 image processor, 3.0-inch LCD screen and Smart Auto shooting mode. There are also several other shooting modes including easy, Program, Aperture Priority, Shutter Priority, Manual and a slew of scene modes. One of the main features of this camera is the very powerful 10x optical zoom lens. Its 35mm equivalent of 36-360mm means that you will be able to get incredibley close to distant objects that most other digicams can't come close to. Helping you to keep the camera steady when using this large lens is the built-in optical image stabilization. In addition to steadying the lens, it also allows you to shoot handheld without a flash at slower shutter speeds than a camera without. Click here to read the Canon PowerShot SX120 IS Press Release.